Rockport things to do - see, eat, drink and be merry! Found 31 blog entries about Things to do. Rockport Festival of Wine & Food 2017! Wednesday, May 24th, 2017 at 5:06pm. Celebrating 21 years of the Rockport Festival of Wine & Food! Come join us for a great weekend of wine, beer, food, music, shopping, and the coast!! This festival helps raise the needed operational funds for the Museum, but also provides a venue for entertainment and fun. Over 2,500 visitors from 26+ states are welcomed on the grounds of the Museum to experience wine, VIP wine tasting, lectures, food vendors, live bands, shopping vendors and beer booths. Wine may be purchased by the taste, glass, bottle or case and this is the only festival of its kind that allows you to try expensive vintage wines by the glass. Wednesday, May 17th, 2017 at 9:55am. Monday, May 15th, 2017 at 10:50am. 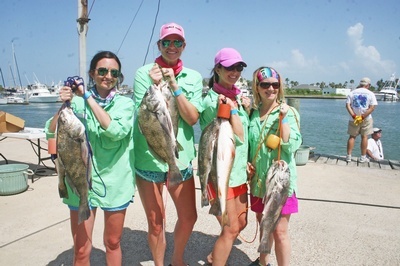 Attention to all ladies with fishing enthusiasm! Here is your opportunity to be a part of the Coastal Bend’s popular Powder Puff Tournament sponsored by Woody’s Sports Center.